Rhythm and meter are two different yet related things when it comes to music. Because of their close relation, it can be difficult to tell the difference between them. It is necessary to understand both rhythm and meter to be able to identify elements in music, analyze a piece and perform it. Rhythm, simply put, is the combination of short and long tones. Rhythm is usually referred to as "beats," which is what you tap your foot to when you hear a piece of music. Rhythm is usually divided into common patterns of beats. Grouping these patterns in an organized and understandable way is meter. Meter must be established to make sense of the rhythm, and the rhythm is placed into measures to better read and understand the music. There are four major types of meter--simple duple, compound duple, simple triple and compound triple. The meter is simple if the beats can be divided in half. The meter is compound if the beats can be divided in thirds. Duple meter means the measure is divided in two, and triple meter means the measure is divided in three. Duple and triple meters typically refer to the division of strong versus weak beats. An example of duple meter is a measure in which the music feels strong-weak-strong-weak, and triple meter would be strong-weak-weak. See the Resources section for a chart to help you learn the differences among meters. Rhythm is a basic aspect of music, and terms used to describe rhythm can be used in different ways. The term "rhythm" usually refers to the pattern of short notes and long notes. The beat is the steady pulse to which you can tap your foot or count the music. "Beat" also refers to the strongest pulses, whereas the offbeat or upbeat is between the pulses. The beats are grouped into measures, also called bars, and the pattern of pulses gives you the meter of the music. Meter is usually identified by a time signature. 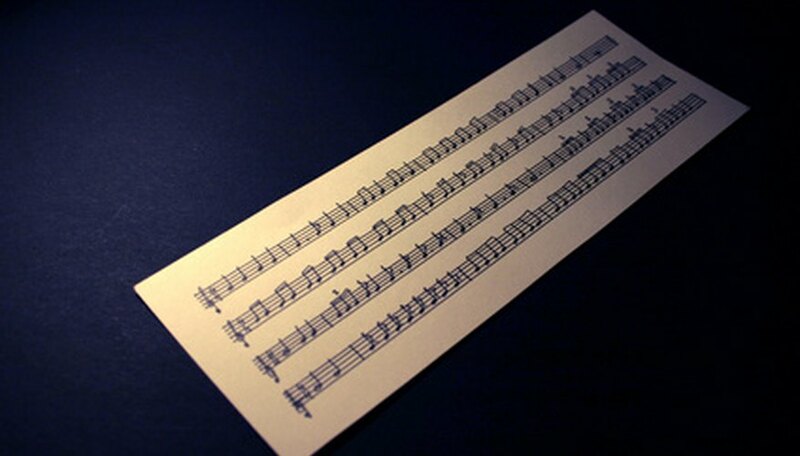 The time signature is found at the beginning of a piece of music; it can change throughout the piece or stay the same. The time signature consists of two numbers. The top number tells you how many beats are in a measure, and the bottom number refers to the kind of note that gets one beat. Thus, the time signature identifies the meter and the type of note with which it is written. There are many types of time signatures that refer to a particular meter. An example of a duple simple time signature is 2/4. Rhythms that can be placed in a measure of 2/4 include quarter, half, eighth and sixteenth notes and rests. An example of a duple compound time signature is 6/8. Rhythms that can be found in a measure of 6/8 time include triplets and dotted quarter notes.